Video 4 in the acid base tutorial video series shows you how to compare the size or electronegativity of the charged atom. Specifically, you want to look at the atoms on the conjugate base when they gain a charge after losing the acidic hydrogen. It’s not just about memorizing when to compare electronegativity, or when to compare atom size, instead the video has a strong focus on helping you understand WHY to compare each aspect in the specific situation. 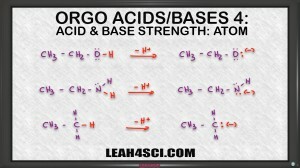 By understanding this you’ll be able to apply it to any acid base question on your organic chemistry quiz or exam. We can use the acidity and basicity trend also right? Acidity/basicity trends come FROM size and electronegativity trends. What if it is neither in the same group nor in same period, then what should we compare ?